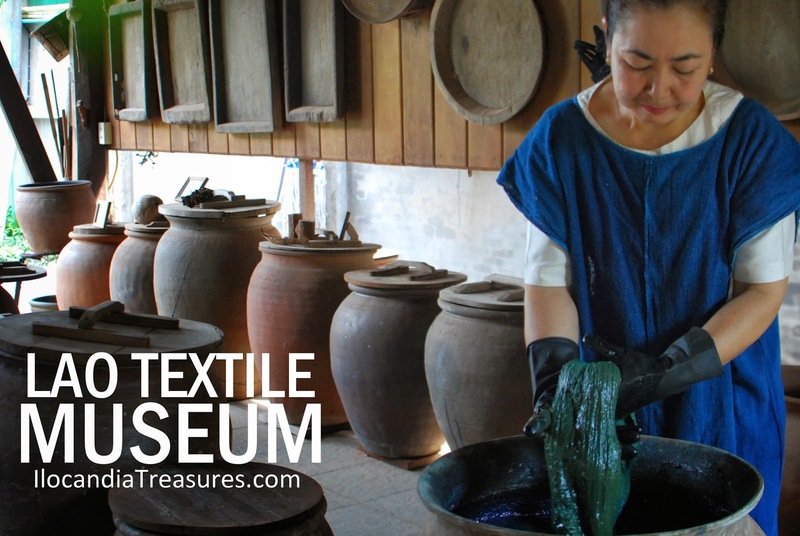 During the SSEAYP International General Assembly in Vientiane, we had the opportunity of visiting the Lao Textile Museum located at the Nongthatai Village. I have asked the local participants which of the institutions to be visited would be the best place to see and the said museum was highly recommended. This is considered the center of Lao culture as it exhibits Lao architecture house style and exposition of ancient handmade silk textiles. The weaving tools were on display and traditional methods of textiles coloring with natural color from leaves and fruits were demonstrated. The museum does activities like coloring and dyeing of cotton scarves, and experiencing the real weaving tools being used. 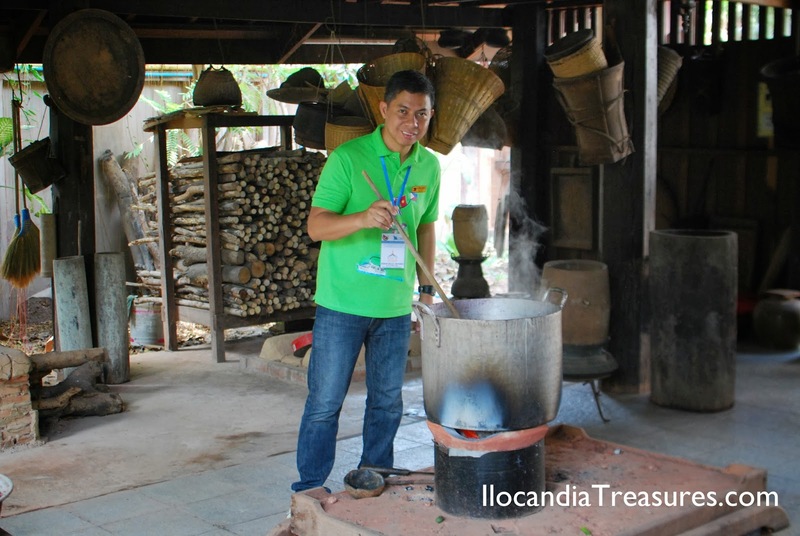 It is founded by Mr. Sisane in 1998 and it’s a part of the Lao-Japan Traditional Cultural Education Center. Just outside the place, one can notice traditional house and its design. When we entered, I had seen several floor looms displayed at the lower ground. Weavers were there to demonstrate to us their work. They showed us the raw materials used then the textiles as output. They were all colorful and came in varied designs. 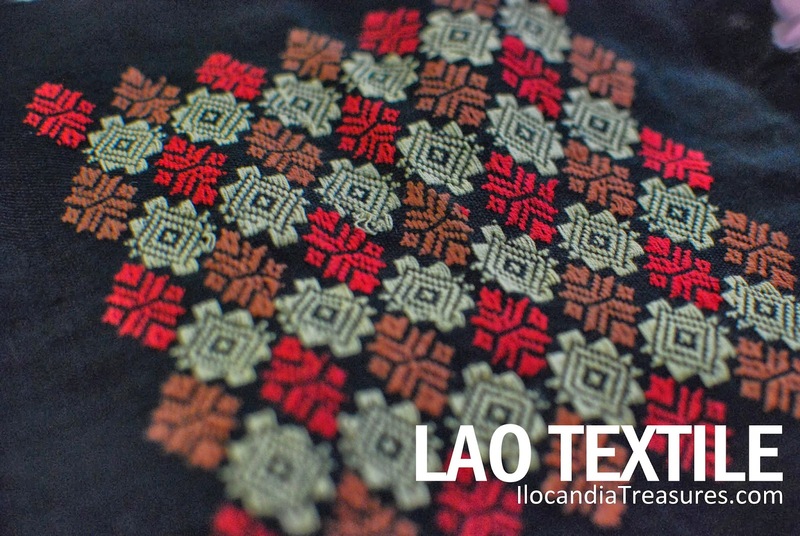 The designs are reflection of the Laotian culture. 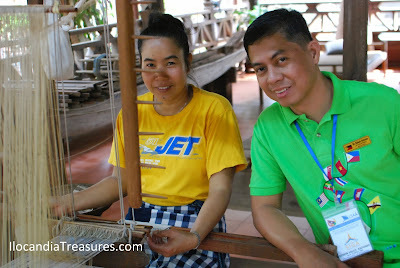 The very basic weaving technique is called tam sat thammada. It literally means weaving by regularly passing shuttles through the weft. 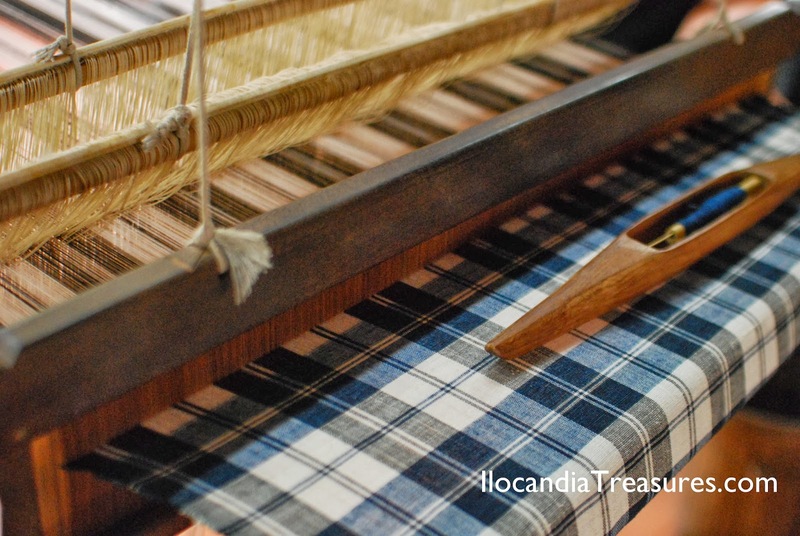 The same color of thread is being used in the warp and the weft however, some would prefer different colours. If alternate colors are used in the warp yarn then the color pattern would be seen lengthwise in the entire fabric whereas if alternate colors for weft yarn it becomes widthwise. If both warp and weft yarns used different colors then a checked pattern would be achieved. 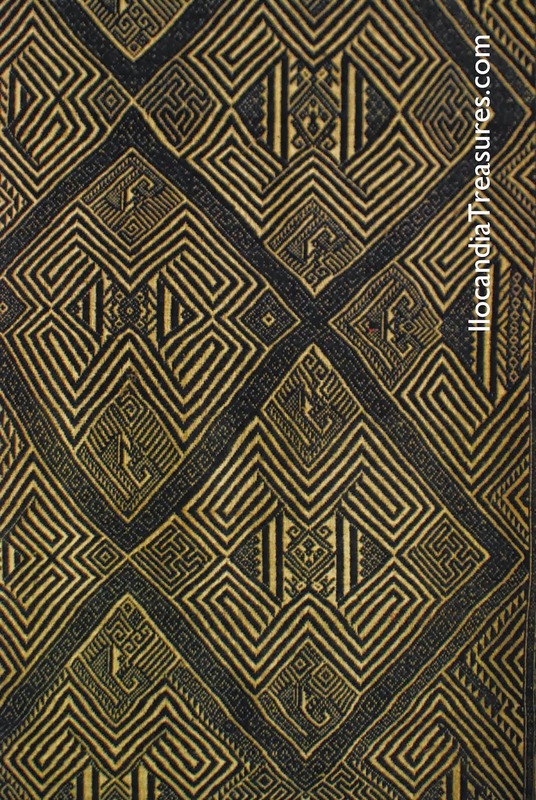 Some of the designs are the traditional Hmong handicraft design that features bags, scarves cushions and more. There was organza silk work. These silk pieces draw their inspiration from traditional wedding blankets. Some of the designs even date back to early 20th Century. The most prevalent designs are the nagas which appear in many many forms and has its origins in both Buddhist and animist tradition. The naga is the gigantic mythical serpent that lives in the Mekong river which is inseparably intertwined with the livelihood of the Lao people. The ardous task of dyeing of the thread was also demonstrated to us. Several dozens of earthened or clay jars were present in the area which they use in the fermentation process for a period of several weeks. The dye appeared green but when mixed it turned into deep bright blue. Dried fruit peels, grasses, coconut shells and other materials were identified as ingredients to the process. They also use the indigo plant which is grown on the grounds. Another exciting activity we had in our SSEAYP International General Assembly (SIGA) in Laos was the almsgiving. It is a practice for the Buddhist religion to share food, incense, flowers, fruits, rice and money for the monks. 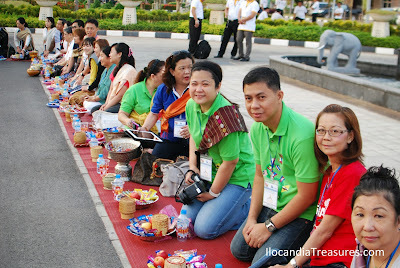 We had the ceremony early in the morning infront of the Don Chan Palace Hotel. We assembled first by forming two lines by placing mats and we knelt down. We put the the food and fruits in golden bowl. 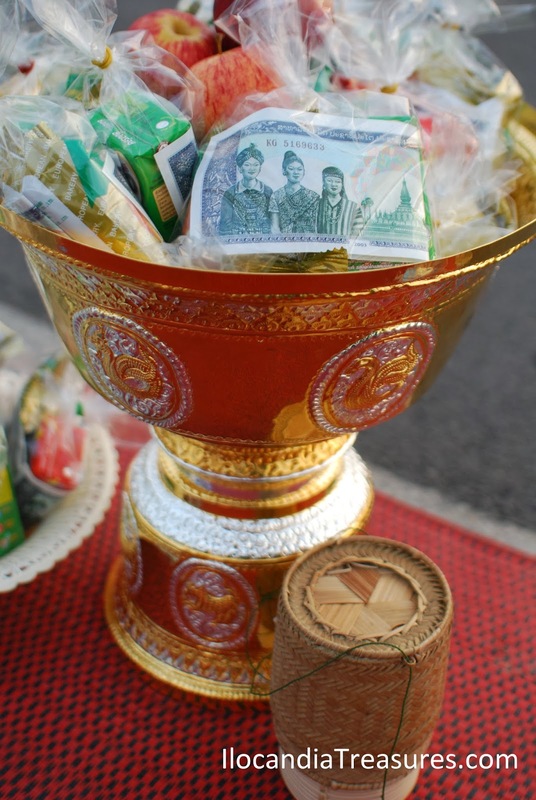 Almsgiving is called tak bat in Laos. It is the respect given by a lay Buddhist to a Buddhist monk. It is presumed as a charity but its more like a symbolic connection to the spiritual realm. It is a way to show humbleness in the presence of the secular society. This humble act establishes connection of the human to the monk. It is an act of virtue that exists in regions and present in other religions such as Christianity, Hinduism and Islam. A few minutes later, the monks arrived in queue and went almsround. They are clad in saffron and walks silently in single file with the older monk first. They carry with them a large lidded bowl attached to a strap hanging from their shoulder. They passed us one by one to collect the alms. 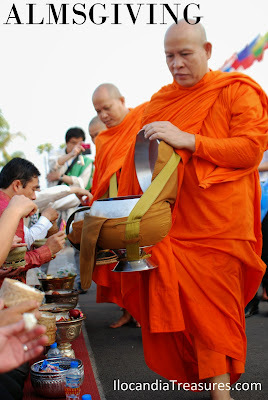 We were advised not to touch their alms bowl in putting inside the food. 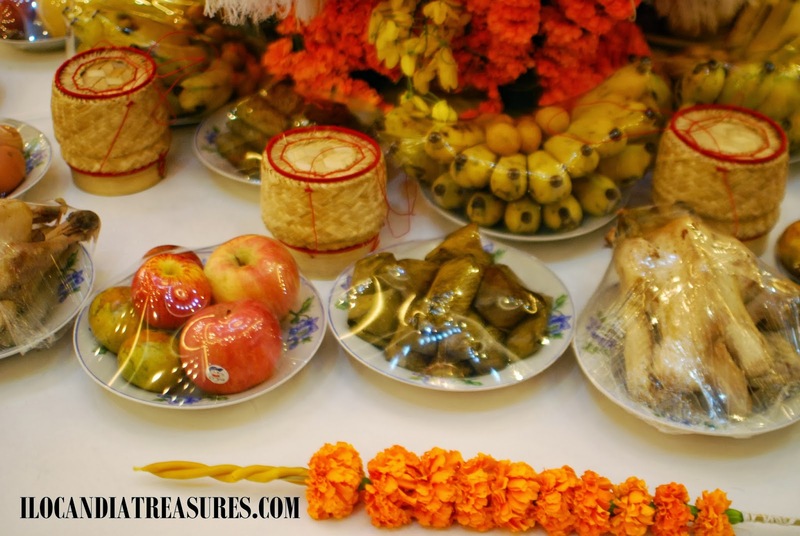 Aside from the food and fruits, we also gave away sticky rice placed in a small woven container but just a scoop for every monk. Lastly, the water was then poured into a plant or tree by the almsgiver and made a wish. This almsgiving ritual is done in silence. I have observed that no one talked while the monk walked in meditation. The ritual establishes the symbiotic relationship between the monk and the almsgiver. The monk needs the food while the almsgiver needs spiritual redemption. A special ceremony in Laos called Baci was held during the SSEAYP International General Assembly (SIGA). 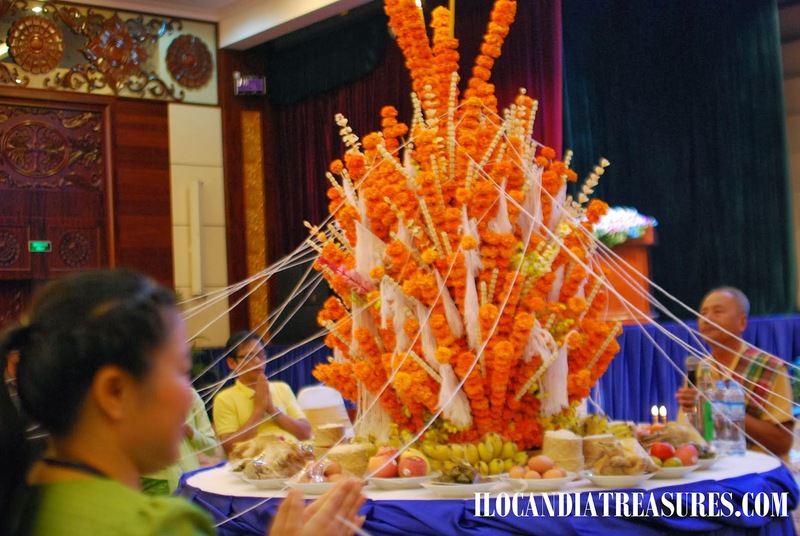 It is a celebration of a special or important event such as wedding, homecoming, a birth of a child, facilitate a cure, recovery from sickness, welcoming the new year, entering the monkhood, festival or simply honoring visitors & guests of importance. 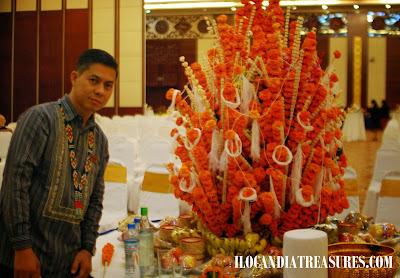 Baci ceremony is also called Su Kwan meaning “calling of the soul.” It is a Lao animist ritual performed before noon or before sunset at any day of the week and all year long. It is a Lao ancient belief that the human being is a union of 32 organs. The kwan is a component of soul and considered as vital breath. It watches over and protects each one of the organ. Many kwan are possibly kept together in the body at any one time. It is believed that all kwan is often the attributed cause of an illness. Then the baci ceremony calls the kwan or souls to get back to the body and thus re-establishes equilibrium. The main component of Baci is the pha kwan which is an arrangement of a cone or horn made of banana leaves sprouting on a silver tray, dish or bowl. It contains flowers, white cotton or silk threads, candles and around the base are food for the kwan. 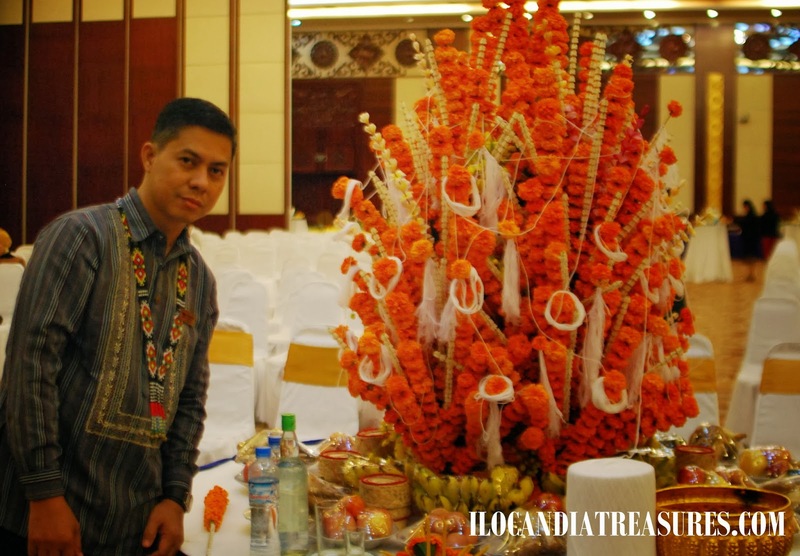 The white thread symbolizes continuity and brotherhood in the community while the flowers symbolize love, longevity and brilliance. The food such as hard boiled egg symbolizes fetus, fruits & sweets symbolize coming together of several parts, stalk of bananas symbolizes forming of a community, rice wine for purification and boiled whole chicken for divination purposes. 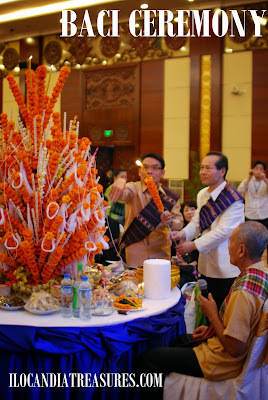 All of us were asked to assemble around the pha kwan and hold each a thread while the important guests lighted up the candle then the elder officiates the ceremony by reciting Buddhist mantras or chants. They call the elder as maw pawn who had been a Buddhist monk once in his life. Everyone in the assembly was in deep silence. Then later everyone offered to tie as many threads to friends and guests present. They wished each one good luck as they tie the threads around the wrist. I was able to receive several threads. Preferrably, they should be worn around the wrist until they fall off themselves but a minimum of three days is ok and should be untied rather than cut off. Then everyone partake of the food offered. I tried eating a little of everything. 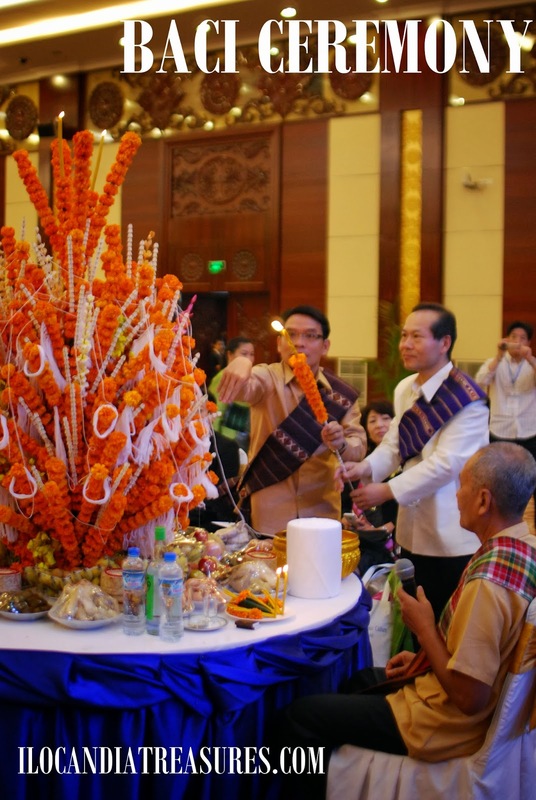 There are steps involved in the ceremony such as the making or preparing of the pah kwan, where the elderly women shared this task. Next step is that the younger people pay respect to the elders. Everyone touches the pah kwan while Buddhist mantra is being chanted. There is the calling of the kwan to return to the body of the person to which the ceremony is intended for. The next stage is the tying of kwan around the extended wrist. Lastly it’s the closing of the ceremony with touching of the pah kwan for several times. 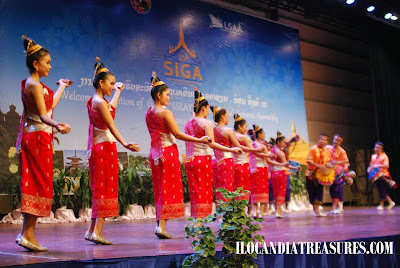 The exciting part of the Baci ceremony is the sharing of meal: Everyone really enjoyed the food offered, then a grand farewell party followed with lots of dancing especially, Lao dances. 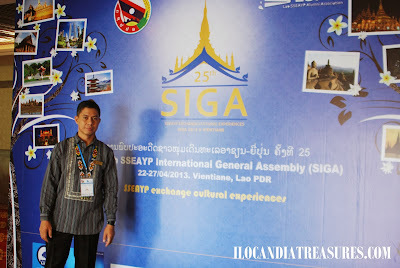 Since I was chosen as one of the SSEAYP International Awardees for 2013, it is but proper to personally accept the recognition by attending the Ship for Southeast Asian Youth Program (SSEAYP) International General Assembly (SIGA) held at the Don Chan Palace in Vientiane, Lao People’s Democratic Republic. I took my flight from Laoag to Manila and rushed to Clark Airport in Pampanga in just a matter of few hours by taking the bus and luckily got in time at the airport for my flight to Bangkok. I flew by 8:45PM. Then proceeded to the Don Mueang domestic airport on a free shuttle bus from the Suvarnabhumi Airport to catch my early morning flight at 6AM to Udon Thani then took a van to the Lao-Thai Friendship Bridge or border and arrived there before 9am. There were local people who received us at the border then waited for some other delegates to come in. We had an orientation at the Don Chan Palace after checking in. I met the delegation from various countries and of course my colleagues from the SSEAYP International Philippines. We started going around downtown by visiting the night market. 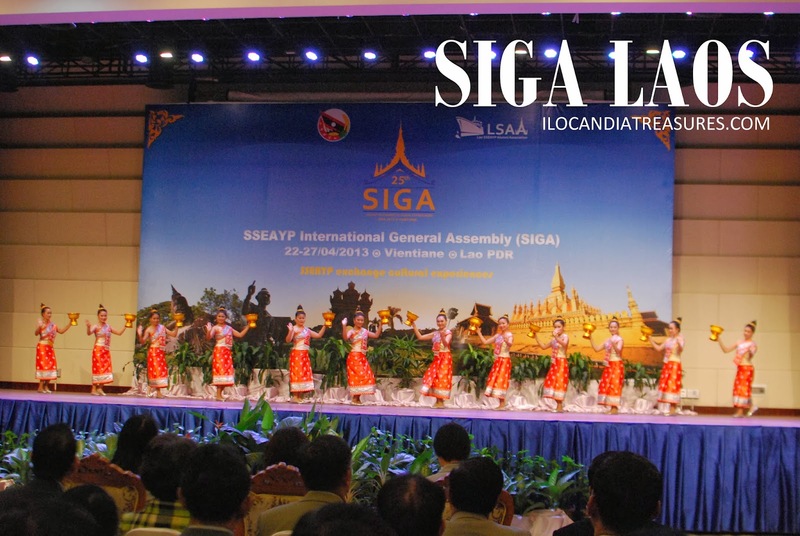 The next day was the opening ceremony with speeches from key officials such as Dr. Vilayvong Bouddakham, Secretary General of Lao Youth Union and Mr. Osamu Shimizu, Vice Minister for Policy Coordination of Cabinet Office who were present in the entire duration of the program. 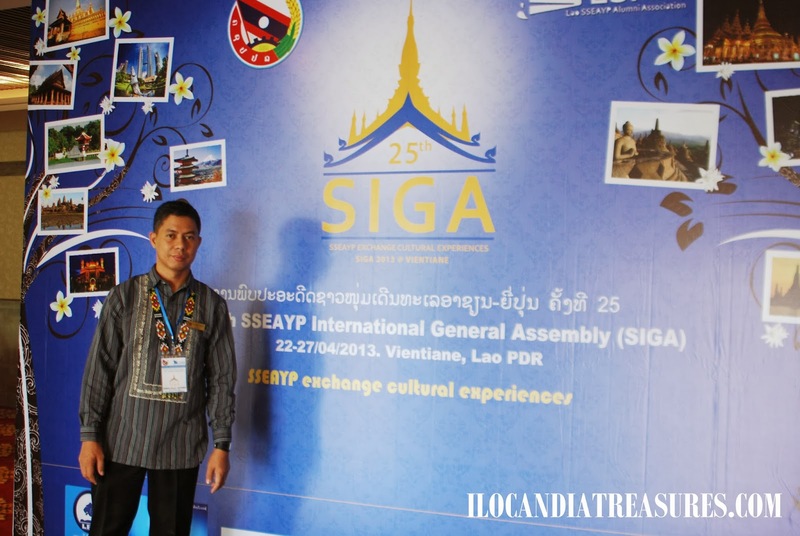 This year’s theme was “SSEAYP exchange cultural experiences” and the SIGA was hosted for the first time by the Lao SSEAYP Alumni Association. There were country reports filed by different alumni associations where their accomplishments in the Social Contribution Activities and post-SSEAYP program activities were highlighted. During the day, a panel discussion was held where successful ex-PYs were invited as panelists. The following topics were discussed: ASEAN-Japan Educational Integration, ASEAN-Japan Young Entrepreneur in Contibution to Society, Tourism and Cultural Promotion in Laos and Youth Development and Social Contribution. 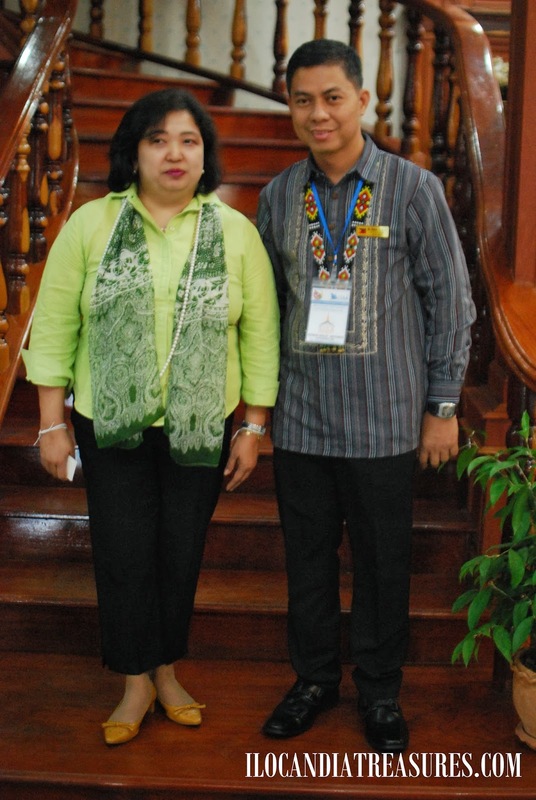 We also did a courtesy visit to the Philippine Embassy in Vientiane and met Ambassador Maria Lumen Isleta and her staff. We were warmly received. The ambassador gave us a briefing about Laos and the embassy’s activities. The absentee voting was ongoing and saw the Sentro Rizal. A welcome reception was held in the evening with sumptuous dinner being served with some wine. It was a feast also for our eyes to see colorful Lao cultural performances. And of course the much awaited SSEAYP International Awards ceremony was conducted. This is given once every three years to alumni who made outstanding contributions not only to alumni associations but to the society as a whole. I was truly honored to receive the recognition from SSEAYP International. On day 2, we started our day with alms giving in front of our hotel to monks who came early in the morning. It was another experience of Lao culture. Later, we were grouped according to our interests and visited the following institutions: Lao Brewery Company, National Art and Music School, Lao Textile Museum, K&B Furniture, Vientiane High School, Buddha Park, Patuxay Monument, Talat Sao Shopping Mall and the That Luang Stupa. Then we proceeded to the headquarters of the Lao Youth Union for our lunch and an afternoon of traditional, cultural exhibition and activities. We concluded our general assembly with a Baci ceremony before the farewell party. 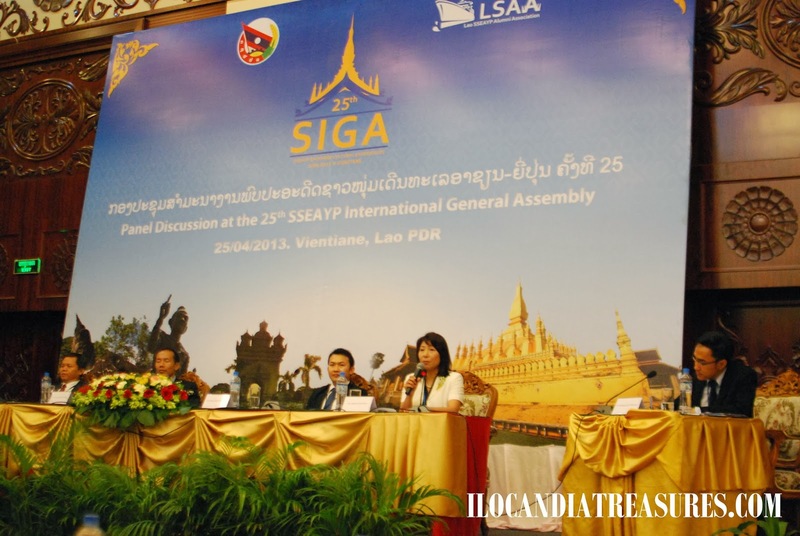 It was announced that the next SIGA will be hosted by Malaysia.